Don and Leatherhead are salvaging parts from a junk yard when a spacecraft arrives. Our heroes find that they cannot control their legs and thus they walk involuntarily into the waiting ship. Inside are three diminutive people, lead by one named Murtal, who asks Don and Leatherhead to help them prevent the Hollow Earth from being destroyed. The mutants aren’t too happy with the circumstances, but before any negotiations can begin, the ship blasts off into the stratosphere and eventually travels through a hidden volcano and arrives inside the Hollow Earth – a place filled with lush jungles. As Don and LH debate the request, they’re suddenly jettisoned from the craft and left on their own. Almost immmediately a tribe of humans arrive and attack them, thinking that they’re demons. Our protaginists are herded to a spot where they’re caught in nets and taken prisoner. Don and LH are put into cages and loaded on the back of mastadons. Once they arrive in the village, their cage is strung high up into the air. The tribe’s leader, apparently a witch of some kind, orders Don and LH to be sacrificed. While they await their fate, a young boy named Emur arrives and tries to free our heroes – but the witch spots him and he is also captured. The three are strung up tothe Tree of Sacrifice, where ferocious beasts await them in a pit below. Emur explains that the tribe fears the cave entrance that the animals guard inside the pit – thus the people make sacrifices to the beasts to keep whatever is inside the cave at bay. 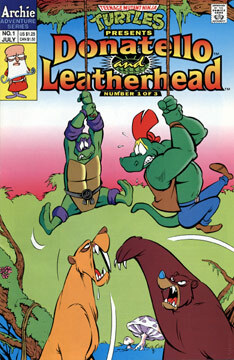 Don uses his skills to swing himself onto the tree limb and frees Leatherhead, but before they can save Emur, his leather binding breaks and he falls into the pit, landing on the back of a woolly rhino, which takes off and runs straight into the cave. Although Latherhead is reluctant, he and Donatello head into the foreboding cavern to find their new ally.